Ride The Wave At Typhoon Lagoon! Last week I introduced my series about Disney’s water parks with Water Parks 101. 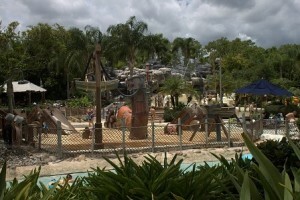 This week I’m back with a closer look at Typhoon Lagoon! The story of this water park centers around a huge storm that hit the area surrounding Mount Mayday. Disney’s attention to detail takes the background story and really gives in life with broken surfboards and boats strewn about among palm trees and white sand beaches. The largest of these boats is Miss Tilly who can’t be missed since she is perched on top of Mount Mayday after being swept up in the storm. 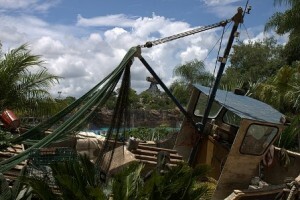 Guests enter through the turnstiles under a tattered sail and then are ushered through lush tropical landscaping. Eventually, they are able to see Mount Mayday and Miss Tilly through the trees. You will encounter a series of buildings dedicated to services one might need while visiting a water park. Singapore Sal’s has bathing suits, sun screen, and a host of other goods in case you forgot anything. 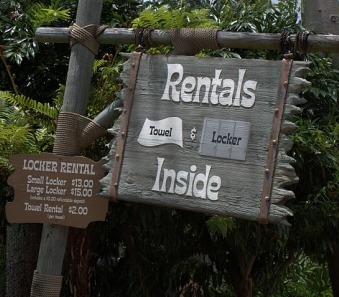 This is also where you can rent a locker or towel for the day. After folks get situated in this area, they’re off to find a lounge chair to claim as their own for the day in one of the many seating areas scattered throughout the park. Then, it’s off the the water slide races! 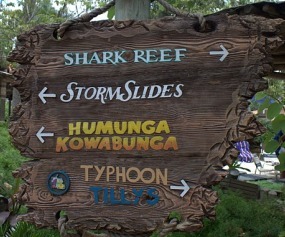 If you’d really like to race you may want to try Humunga Kowabunga, Typhoon Lagoon’s fastest slide. There is a five story drop inside an enclosed tube which is enough to make even the most adventurous guest nervous. Three identical slides are lined up side by side to create this attraction with a viewing area for those of us who are too chicken to try it. Humunga Kowabunga tops out at about 30 miles an hour so girls should be careful of their bikini tops and kids under 48 inches wont be able to slide. I didn’t get up the guts to tackle this slide, but some of my friends did and thought it was a lot of fun! Nearby the Storm Slides are a series of three body slides nestled into Mount Mayday. The Jib Jammer, Stern Burner, and Rudder Buster each offer a curvy adventure ending in a small pool. I thought the one I did was a lot of fun, but I didn’t love it enough to trek up the stairs again to try one of the others. Some of my friends felt some discomfort sliding without a tube or mat, so be aware of that if you want to give these a go. Another exciting attraction is Crush ‘n’ Gusher which is Typhoon Lagoon’s newest addition and it is actually a “water coaster” rather than a water slide. Not only do riders slide down hill, but jets of water propel them up as well! The setting is in an abandoned fruit processing plant where guests (representing the fruit) board tubes built for one to three guests to get washed away. There are three water coaster options, Banana Blaster, Coconut Crusher, and Pineapple Plunger all offering different twists and turns. Crush ‘n’ Gusher is certainly one of the most popular attractions in Typhoon Lagoon so be sure to hit it early especially if you’d like to try all three slides. There is a 48 inch height requirement for this attraction so little guys and girls will have to sit this one out. I really love this attraction and I hope you will too! 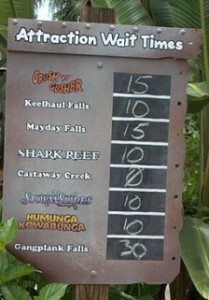 Gang Plank Falls is Typhoon Lagoon’s family raft ride. Disney’s website says the rafts hold four people. Well, we fit four people in it, but it sure wasn’t comfortable. We had two men and two women in our raft and I’m short, but my knees were in my face since I could curl up better than the guys could. To make matters worse we got stuck a few times! If you have a party with kids, try to mix up your raft with kids and adults to make things more pleasant. The ride is relatively short, so if you have to squeeze at least it’s over quickly. Keelhaul Falls is a single person tube slide where guests will slip down several twists and turns on their way down the mountain. Nearby Mayday Falls has a similar experience for guests riding single person tubes. May Day falls is thought to be the most intense (really not that intense) of the three tube slides and it is the longest slide in Typhoon Lagoon. There is no height requirement for these slides, so kids and adults can enjoy them. Both of these attractions had long waits later in the day when we visited, but we enjoyed them first thing with very little wait. I’d say they are fun if you can ride them quickly, but they may not be worth a long queue. When you’re tired of climbing stairs try one of the many non-slide options around the park! One of them is Ketchakiddie Creek, the area reserved just for kids at Typhoon Lagoon. Adults are not permitted to enter the area without a child so they really mean it when they say it’s for kids. This water playground features small slides as well as fountains and other wet fun for kids under 48 inches. This area is located toward the rear of the park and can easily be accessible on foot or via the lazy river. 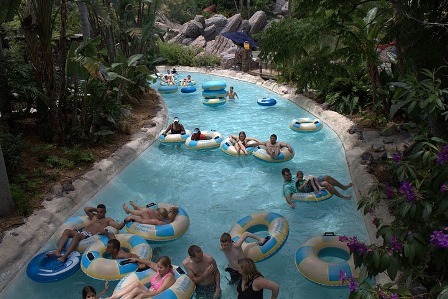 Speaking of the lazy river, Typhoon Lagoon’s version is called Castaway Creek and winds its way around perimeter of the park. There are five locations where guests can enter and exit the lazy river. Inner tubes are available for you to use to float along with the river’s current through lush tropical settings as well as caves and water falls. I can’t say enough good things about Castaway Creek! I could go around and around without getting bored. Folks may want to use the stairs near the entrances to give themselves a boost into their tubes if they are short like me. 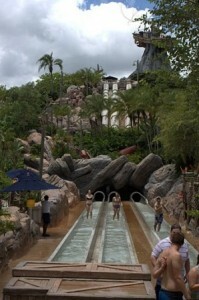 I also recommend using the lazy river as a mode of transportation from one attraction to another within the park. 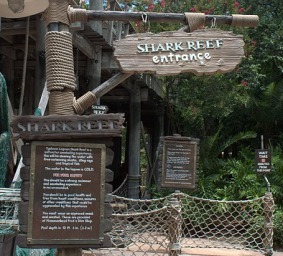 Shark Reef is probably one of my favorite attractions at Typhoon Lagoon even though sharks give me the creeps. 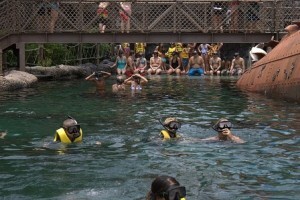 Here guests don snorkels and masks and swim along among sharks, stingrays, and fish. Guests who do not wish to swim with the fishes can opt to look at them behind glass from the viewing area inside the area’s sunken boat. 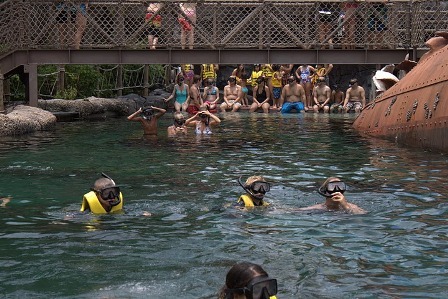 Kids under 10 must be accompanied by an adult to get a chance to snorkel. After collecting their equipment, showering, and getting a brief lesson on how to properly swim with your mask, guests enter the salt water tank. I should warn you this water is a bit chilly in order to keep the fish happy. If you just can’t get enough of the sharks, you can try swim with a SAS tank for an additional charge. Stop by Hammer Head Fred’s Dive Shop for more information or to sign up for a 30 minute session. 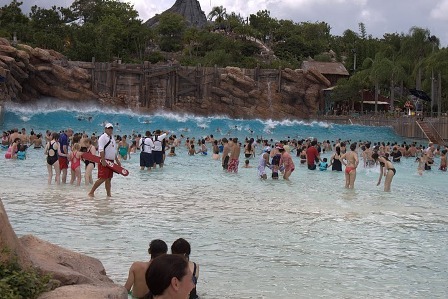 The centerpiece of Typhoon Lagoon is its Surf Pool. There are two settings in this wave maker, one will send out a six foot wave every 90 seconds, and the other will produce constant small swells. Swimming in the wave pool can be tough and if you aren’t so sure of your aquatic skills, you may want to stick to the shallow areas (life vests are available free of charge as well). I grew up on the beaches of the Jersey Shore so I always look forward to body surfing or treading water out past the waves’ breaking points. It should also be noted the floor of the wave pool is made of a rough concrete surface and can really scrape you up if you don’t play it right. Your best bet is to dive under the crashing wave so you don’t get tossed around too much. I often make this the last stop on my tour since the crowds are almost always manageable and I’m always pooped after a session in the Surf Pool. 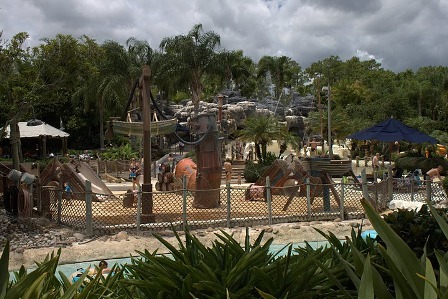 We were able to experience all of Typhoon Lagoon’s attractions with a lunch break by about 2 p.m., but I’ll write more about our Touring Plan use later. That being said, you probably would not have to dedicate an entire day of your vacation to the park. Of course, if you really wanted to make a day of it and lounge around in a chair or floating in the lazy river, you certainly could without getting bored. I really loved being done by two since it allowed us to shower and take a nap before heading out to Magic Kingdom later in the evening. 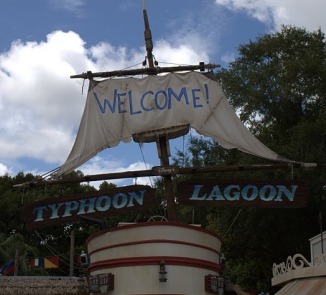 Hours of operation at Typhoon Lagoon, so be sure to double check them for your travel dates. 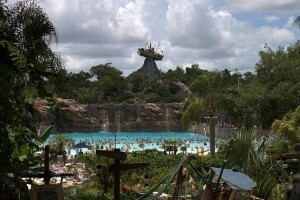 This water park will be closed for its annual refurbishment from December 4, 2011 through March 17, 2012. Have you visited Typhoon Lagoon recently? Let me know what you think about Disney’s tropical water park in the comments! Not to worry, I didn’t forget about Blizzard Beach! I’ll be back next time to give it the same in depth treatment. A special thanks goes out to Neil Citro for his help taking photos for these posts. 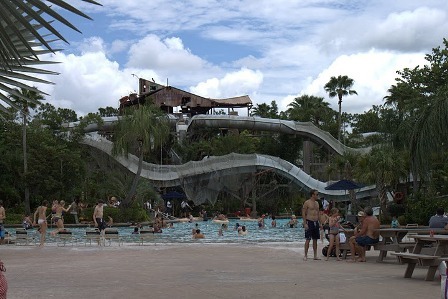 Great series on the Waterparks–very informative–sounds as though you had a wonderful time. You’d mentioned using the Touring Plans and I was wondering if you did stick to the Unofficial Guide for Tyhpoon Lagoon. We’re going later this month and want to make sure we can do both Shark Reef and the Crush and Gusher. Thanks! Thanks, Trina! I did do the Touring Plans for adults for both water parks on that trip. I’ll be writing about them in detail next week. I hope they’re helpful to you! Hello, I was just curious if we need to bring our own towels to the Disney Waterparks?